ONE of the country’s most threatened bird species is bucking serious decline by finding a protected haven. Parts of the North York Moors are continuing to see steady numbers of ring ouzels, despite a dramatic fall in population across the UK in recent years. 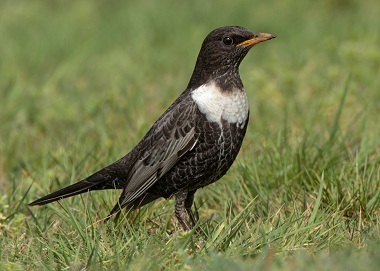 A study in 1999 put the ring ouzel on the Red List of highest conservation concern and conservationists expect the latest national survey to show further decline. However, the charismatic little bird appears to be thriving in areas of moorland sanctuary, according to ornithologist Ken Hutchinson. On Spaunton Moor, near Kirkbymoorside, he said a record 14 nests were monitored last year, along with 23 territories, the highest recorded in hundreds of hours of painstaking monitoring over 15 years of study. Numbers of ring ouzel have dropped nationally at an alarming rate over the past 25 years and Ken puts the success on Spaunton Moor down to careful management and predator control. He explained: “I’m sure habitat managed primarily for red grouse has a large part to play in the breeding success of this beautiful and distinctive bird. “They rely on heather covered moorland and nest on the ground, preferring steep heather banks or rocky ledges. However, this makes them very vulnerable to foxes, stoats, crows, magpies and weasels. In 2012, although overall breeding activity was up, cold, wet weather, from April to June took its toll on numbers fledged, alongside predator attacks. Ken said another hardship last year came from a lack of rowan berries, particularly valuable to ring ouzels just before they migrate. Last year’s poor summer meant they ripened too late and the birds left the area undernourished. Spaunton Moor owner and North York Moors representative of the Moorland Association, George Winn-Darley, said: “We are delighted such rare, endangered species have been given crucial help by our grouse moor management. “Clearly, looking after our heather and controlling predators before and during the breeding season is making a difference. “We only seek a managed balance of all species on the moor and in relation to rowan trees, are encouraging our members and other landowners to plant where appropriate.